Many gamers who venture into the MMO genre have participated in some aspects of role-playing. How far players go with their characters tends to differ. Those gamers, who relish creating, elaborate back-story for their characters and becoming that character while playing the game. This adds another element to gameplay some players either get or they fail to fully understand. SWTOR story element has made folks care about the choices their characters make, and that is role-playing. Today’s guild goes into great detail with their RP and hopes some more of you might just give it a try. 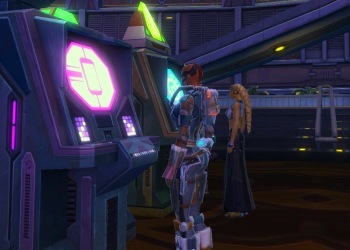 Walking through the back alleys of Nar Shaddaa is a quick way to wind-up dead or make some fast credits…depending on what side of the law you are on and how fast you are with a blaster. I had heard about a new group on the scene…small but very capable bunch of guns for hire. They also helped with security and other assorted jobs, as long as the money was right. I made my way to the location on my holo and waited cautiously. “Shall we get down to business?” she said. 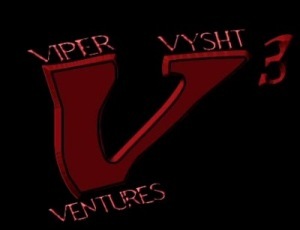 How did Viper & Vysht Ventures get its start? It got its start a few months ago on Lord Adraas when the guild that I was in before went dormant. A lot of the members had moved on from the game or to other guilds at the time, and I got an idea to finally run a guild with a criminal and business theme to it. That is how Viper and Vysht Ventures got its start. Since the guild is neutral in character how did the guild decide on a faction? While we are neutral in character with being based on Nar Shaddaa as well as dealing with all sorts in business, from the Republic to the Empire and in between, all the characters in the guild are Empire faction. This came about from Vaanthe being a bounty hunter as well as others in the guild being bounty hunters, agents, and so forth. What server is the guild located on and is this server V&V Ventures was first found? We are located on the Ebon Hawk RP-PVE server, but it is not our original server. Before the server merge, we were located on the Lord Adraas server. We have really enjoyed the new server. Since the move and found the Ebon Hawk community to be quite welcoming as well as enjoying the experience of meeting others that came from various servers. How did character transfers go for the guild? Is the guild enjoying seeing more folks on the planets and fleet? The character transfers went well with all of the active guild members joining us on Ebon Hawk. Yes, the guild has definitely enjoyed the increased opportunities that a bigger population affords. Obviously the big news is the new F2P option coming this Fall. How do you and the guild feel about this? What do you all see positive and what could be the negatives? Well, I am not surprised that the game is actually going that way as rumors have circulated about it for a while. Other MMOs seem to be going that way as well for their subscription model. As for positive effects from this, an increase in the amount of people playing is one thing that I could foresee as well as other that have quit the game might now return to play. With negatives, well, I have not really found many that worry me too much. Can you explain the in-character persona of the guild? Would you like to see the game get a possible bounty system? The tracking and retrieval of sentient beings, either living or deceased. Event support – This can depend on the manner and purpose as well as the size of the gathering, but we have some of the finest and experienced staff that have skills in catering, entertainment, and various things. Private Investigation – Need someone found, or information obtained? Perhaps you also need someone to disappear, for their own security, of course, then looks us up. Various contractors within the VVV organization have their own skills, which can include some medical services of the sensitive nature among other things. Note that the latter means that we do have some more than competent medical staff in our company that could fix up any broken sentient beings. We do not claim to do it all, but if you are looking for any of the above, then call VVV. As for a bounty hunting system, I would love to see the game get one, though actually, some of the role players have found ways to handle it in the game through role play as well as even a ‘bounty board’ on Ebon Hawk and other servers being used. How would you explain in basic terms how a Role-Play guild works? 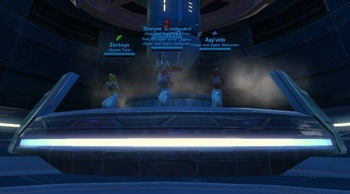 What do you and your guild members like best about RP in games like SWTOR? I think that can depend on the guild, though with us, we are a ‘heavy’ role playing guild. While we do enjoy the game and what it has to offer in content, a lot of what we do is ‘in character’ and centers on our role play. For us, that includes criminal activity, business, and other aspects of that… all ‘in character’, of course. Of course, we do interact ‘out of character’ and do things that way as well, but role play is really a big focus for us. We like Stars Wars as a setting, the community, and creating stories with others as well as having fun. How did your guild get involved with SWTOR? Is this the only game your guild plays currently? I have been looking forward to the game since well before launch as had friends of mine. Once the game came out, we started playing it, and still do. This is the only game that the guild is involved in, currently. Along with the announcement about F2P option coming this Fall, they also mentioned another Operation, HK-51, and another Warzone. Which of those things is V&V Ventures most excited about? Actually, depends on whom you talk to in the guild. Some of us enjoy operations, some war zones, and so forth. I know that a few of the members are really looking forward to another Warzone as they enjoy PVP. Others have mentioned the new companion as well. How would you describe the guild’s progression in the game? Do you think some folks have a misconception about RP guilds being all about their backstory and do not focus on the actual game elements? The guild progresses through role play and that interaction… it is an organic process, which depends on the role play and the members as well as those others that we interact with. Yes, some people have that misconception, but I have not run into many that have thought that. If the guild had control of development, what is one change V&V Ventures would implement into SWTOR and why? I think some of us would definitely add chat bubbles as would other role players. While some might not see the point of ‘chat bubbles’, that really does help add to the ease of seeing whom is saying what in crowded areas during events and role play. Is V&V Ventures currently recruiting? If so are there certain classes/advance classes the guild needs? What steps should potential new recruits take to help become a member? Yes, we are usually open to recruiting new members, though we are more about quality than quantity. We do not look to be larger in numbers, but we like to be sure that the members work well with the concept of the guild in role play as well as have fun and get along with other outside the role play as well. New recruits can look at our website to see the start of how to join us, which includes role play and the ‘in character’ interview to get involved in the group. We like to make sure each person’s character actually fits into the group in character so that interaction is vital and takes place. We also have members feel out an ‘out of character’ application so we get to know them a bit, and in turn, they can ask us questions as well. How is the best way for folks to contact you or other members of the guild to get more information? The best way is find us in game as well as you can just go by our guild’s website. Information about the guild is there as well as the guild application as well. 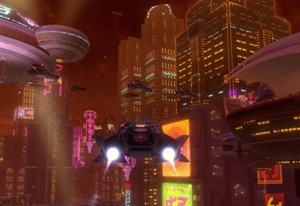 Of course, we can be found on the Ebon Hawk server around Nar Shaddaa and other locations. Any of the guild officers, members, and I are happy to answer questions and role play too. Vaanthe nodded with a knowing smirk as she finished her drink. Having gathered the information and finishing my drink, I tossed a few extra credit chips to the waitress and got up from the table. As I turned back to the table…Vaanthe was gone, back into the shadows. That’s it for this week’s Community Checkpoint and my attempts at RP. I want to thank all the members of Viper & Vysht Ventures for letting us learn more about their RP guild. I want to give a huge shout out to Vaanthe and T’oni for their time and the correspondence to get this article all together. Thanks for another great article on my guild!